The year 2015 was stressful for me, both on the personal and professional front. On the professional front I struggled with finding purpose in what we were doing. Perhaps I needed a break. Perhaps we were losing the essence of what it meant to be a startup in the race for metrics, and chasing growth. I don’t mean to undermine the efforts of our team, and sound cynical, but the valuation game that is being played is very real, and distracting. It can be exciting for a bit, but after a while, it is barely satisfying. Needless to say, it was no longer fun for me, which has usually been the most important factor in doing something. And I was lucky to find myself in a dispensible position, which was often not the case in the past. So, I made a move out, knowing that it will take me some time to figure out what to do next. As simple as that. No glorious ideas about what I would do next, no chasing unicorns, just a blank canvas. ///     / \___/            look, a text unicorn! Making IBS taught me important lessons about working smart, minimizing the foot-print of the product, automating all kinds of stuff so that I would not have to spend more than a couple of hours a week on it, and obsessively worrying about making it so good, that people come back to use it again. Some startup purists argue that small businesses are not worth the time, but I don’t see anything wrong with working on small businesses, purely because of the ideas you get to learn from them can be applied with much larger consequences elsewhere. They serve as a good ground for experimentation and exploration. Ironically enough, when one is working to meet valuation targets, the fear of failure and exploration is daunting. Products tend to become more complex, rather than more simple. Saying no feels like we’re not doing enough. Very few organizations are able to strike this balance. Enter, doing things for fun. The creative boundaries are expanded. Exploration is often the goal, and getting an interesting product/market fit almost comes as a side-effect. Even if it does not, it is the process that I like to imbibe. For eg. this time I intend to throw all I have at writing. It is a skill I have always wanted to develop, but rarely find the time to practice. I intend to get even sharper and quicker at finding a product/market fit. I also intend to learn how to break the clutter of marketing, to reach out to a large number of customers, hopefully doing it much faster than the previous time. Sounds like fun? Well it is! I can also name it something stupid for bonus.. So that’s roughly what Fliptrazon is right now. A fun project, that is highly likely be a small business. And in the next 6 months, I intend to find out what kind of wheels I can put on it, to make it a much larger business. 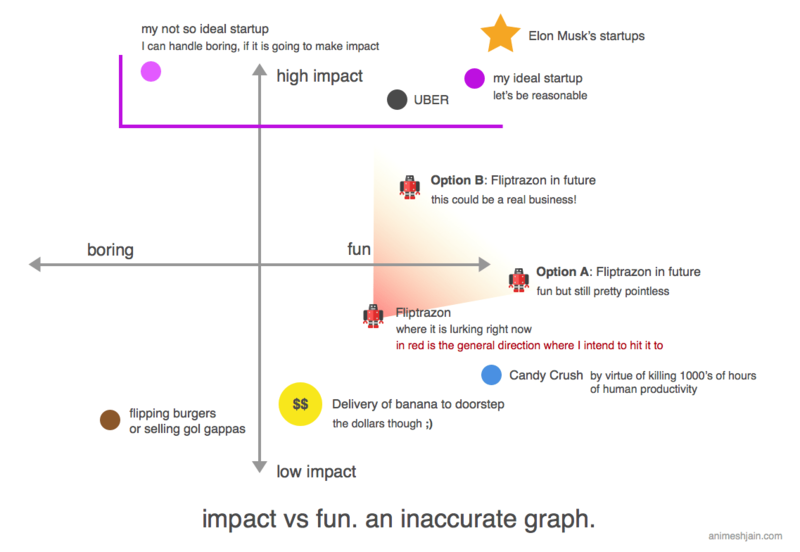 Fun exercise : Do tell me where you would like to place startups (your own or otherwise) on this graph. Update: I just made an email list. Subscribe here if you want to follow my writing. I’m hoping to create some social pressure so that I keep up. Thanks for the generous comments Siddharth. Let’s just try and get along with a blog post or two every month I’d say. I can barely read a book end to end these days, always end up leaving them half read! Nicely written and expressed article…keep it up. Yes may be you can write a book. Dude…some good writer you have become. Abe philosopher maat ban jaana. All the best in your projects to fun and success. Sounds like fun; especially is the fun projects can be systemize to work on automation to produce a secondary passive income. I m curious though, what do you mean by high impact projects? Is it the social impact, reach, must have factor or is it a personal definition of high impact. Ideally, high impact in both intensity and scale (both are relative terms though). The impact itself could be social, technological, scientific etc. Also certain businesses create a very direct impact on people’s lives and are lower down the stream. Some are up the stream, probably not noticed directly by the larger population (for instance b2b businesses / products). Also, I agree, it does come down to personal definition as well. For instance, personally I would put a high value on innovation. Which means, I wouldn’t find making a(nother) delivery business impactful (given the current market, competitors etc), but so many entrepreneurs and investors still do. I feel there’s already too many people, and too much money gone into it. Another example, I am not very enthusiastic about building a business which scales with people. While those can be very high impact businesses like Infosys, Wipro etc., it is not what I would personally enjoy doing. Animesh….I found a systematic and clear flow of your thoughts (partially of self satisfaction and of desire to achieve some fruitful in terms of the society) in your writing….In all of your efforts you always focused on affiliate markets why you don’t put your energy to create a unique your own product…..or service………I feel you are approaching to the million people to provide the best price of a product….so I can see it in terms of the service of society…….you just hold to launch any service with this business model and rethink because one day you will be saturated from this model and you will try to do something for which you have taken rest……..there are three things one is commitment for himself 2. second is for the family and third is for society…….your commitment purpose is to provide the best facilities to the society in terms of the service or product…….second……good education to the million people by using the latest technology …or committed to provide good houses, food and water to million people……. these are three areas in which all the same minded people are working……..
you remain focus till now on education related materials (books,) and now articles……so your one area of interests you have to see out of these…….and that will be where you gave more times to anyone of these either by reading the books, picking the best books, or writing the books….in coming days……………. or you have to provide good education to million people by using the technology……. because you have a good team of technical people…..
Hi Sushil, appreciate the feedback. I agree with many of your thoughts. The search for something more meaningful continues (with Fliptrazon or not). Life is too short to make everyone happy. Life is too short to seek validation from others. I used Fliptrazon last month to book tickets on MMT. I was in and out with a coupon under 60 seconds and I think that’s pretty cool. I’d rather use a minimalist tool than waste time finding the Rajas and Ranis of the Dunia. haha.. glad you liked it :) Will let you in on the android app for some early feedback before we launch. We’re making a simple widget to make it slightly easier to use on mobile. That looks solid dude. Very useful! Thanks for putting in the effort.